Seeing the square gallon container in action made me realize there are advantages to a square paint container over the traditional metal, circular paint can. When was the last time you poured paint out of a typical metal paint can? Remember how excess paint poured down the side of the can and dripped all over? And how paint filled the groove on the top of the can? Recall that once you pour from the can, you cannot read the label on the can because it is covered in paint that dripped down the outside. And when you closed the can, and hammered the lid, did paint spray all around you and the surrounding room? 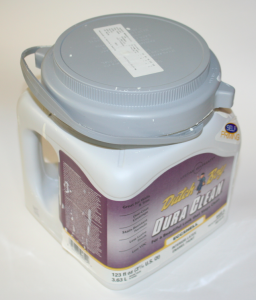 The square plastic container has a contoured opening with a built-in pourer shaped like a beverage pitcher that allows paint to be poured easily and without any dripping down the side of the container therefore avoiding a mess. Plus, there is an ingenious groove on the top of the container that allows paint to flow back inside the container rather than drip down the side. Did I mention the container has a built-in comfortable handle that does not dig into your fingers like its circular can cousin’s handle? And no need to worry where you left the paint can opener, the square plastic container has a screw off lid that does not require any tools to open. The square container, which I learned is called the Dutch Boy Twist & Pour, can hold more paint in a shorter container (given is rectangular shape) as compared to the traditional circular can. As a result, from a storage and shipping perspective, the square plastic containers can be more efficiently packed into a smaller space than a curricular paint can. I continued to wonder why the square paint container, with all its advantage, did not take over the paint can world by storm? How is it that I can still find a circular metal can in the store given the advantages of this magical plastic container? Okay, so you may not care about this paint container…but it made me wonder what other products or services are as good as they can be, and no further positive refinement or evolution is possible. And which products and services are accepted as they are, but could stand for dramatic improvement. Be careful to have proper ventilation while painting or else you get a bit loopy. Don’t forget to critically think about the status quo. And where appropriate, in a professional and respectful manner, relentlessly drive toward better approaches (processes) to create higher-quality output (products). Look for opportunities to use disruptive-technology and -innovation techniques to dramatically change the way “things are done”.